This trail takes you to a fantastic panoramic view. 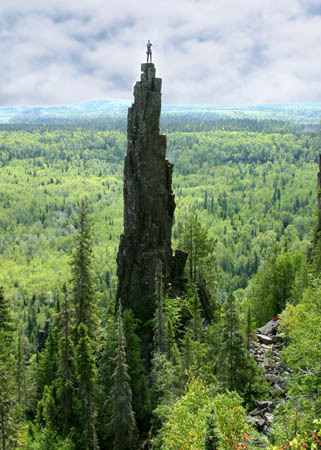 The main attraction is the rock formation known to hikers as The Pinnacles, and to climbers as The Dorion Tower. Travel East on highway 11/17 and turn left onto Ouimet Canyon road at approximately 70km from Thunder Bay. After 3.6 km turn right onto Valley Road. Drive down Valley Road for 3.3 km and then turn left onto Tower Road. If you get to Eagle Canyon Adventures you have missed the turn off onto Tower Road. Follow Tower road to where it ends and park near the tower building. You will need a 4×4 vehicle on Tower Road. The trail head is located opposite the road directly in line with the tower and is flagged. It takes about 20 minutes to hike the trail to the lookout. From the lookout there is a scramble down to the bottom of the canyon that climbers use to get to the base of the Dorion Tower. Sign up for my monthly newsletters to keep updated with all the good stuff.